How Long is Army Basic Training? 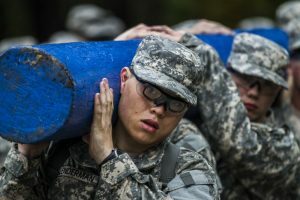 Before you get shipped off to Army Basic Training, you’ll probably want to know how long you’ll be there and what you will be required to do. Basic Combat Training or Boot Camp is a 10-week training course designed to turn ordinary men and women into exceptional U.S. soldiers. While at Basic Training new Army recruits will train for 12-14 hours a day, Monday through Saturday. Sunday is reserved for religious services and personal time. A few highlights include taking the Army Physical Fitness Test multiple times, learning to march and being issued your own M16A4. Army Basic Training is broken down into three phases: Red, White and Blue. Each phase lasts about 3 weeks, with family day and graduation occurring in the 10th week. Below is a summary of the training courses and exercises that will be covered in each phase. While your schedule may vary, this will give you a general idea of what type of activities will be taking place over the next 10 weeks. Army Basic Training is only 10 weeks, but for most new recruits it will feel like a lifetime. Having to do both physical training and classroom activities for 12 hours per day will be an exhausting process. However, at the end of boot camp each new soldier will be well prepared to serve their country with confidence and pride. Did we miss any parts of Basic Training that you would like us to add? Just let us know. What’s the Best Rifle Scope of 2017? What are the Requirements to Join the U.S. Army?